Among the many current periodicals in the world, very few can claim such an authority, that even the oldest issues keep all their usefulness one century after their publication. That is however the case for Analecta Bollandiana, a journal of critical hagiography, edited and published since 1882 by the Société des Bollandistes in Brussels. Since the very beginning, the journal was conceived as a continuous updating of the prestigious Acta Sanctorum series, as well as an entirely new instrument devoted to hagiographical research. Every issue contains both critical editions of hagiographical texts (Greek, Latin, Oriental…), and fundamental studies about hagiography. The articles are published in modern international languages (English, French, German or Italian), although an English summary has been appended in the latest issues to all the contributions which are not written in English. About one fifth of each issue is devoted to book reviews and bibliography on hagiography. Such contents make the Analecta Bollandiana indispensable in any department of medieval, Byzantine, Slavonic or Christian oriental studies, as well as of Church history, comparative religions, ethnology and folklore. 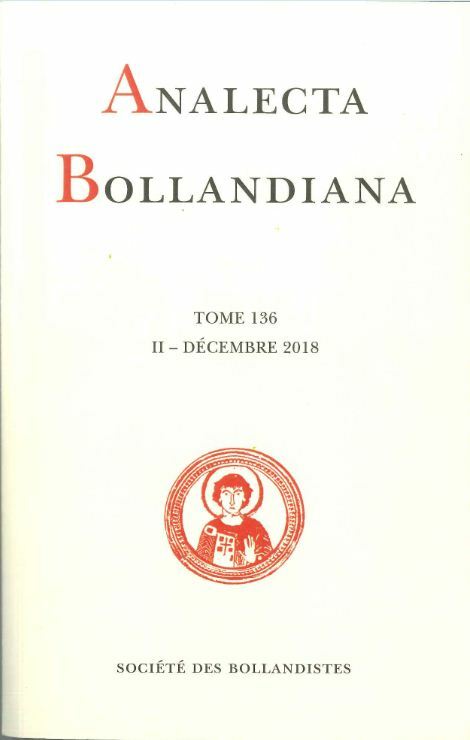 With both the inheritance of the great tradition given by the Acta Sanctorum and the actual support of a highly qualified international scientific committee, Analecta Bollandiana has been for a century and will remain the ideal forum for everyone interested in Christian hagiography. Robert GODDING (Director), Bernard JOASSART, Xavier LEQUEUX, François DE VRIENDT (Secretary). Theofried BAUMEISTER (Mainz), Sebastian BROCK (Oxford), Paolo CHIESA (Milano), François DOLBEAU (Paris), Getatchew HAILE (Collegeville MN), Michael LAPIDGE (Cambridge), José Carlos MARTIN IGLESIAS (Salamanca), Jacques NORET (Brussels), Pádraig Ó RIAIN (Cork), Francis J. THOMSON (Antwerp), Ugo ZANETTI (Chevetogne). in issues of 240 pages each (480 pp. a year). The table of contents of all published volumes since vol. 1 (1882) is accessible on Brepolsonline. Vol. 1 (1882) – 128 (2010) in 126 vols., each vol. : EUR 110.00 (not including post and package). Special offer: EUR 25.00 for each annual volume (minimum purchase of 4 annual volumes), shipping not included. A few years are out of print. A very limited number of complete collections is still available. This practical inventory, published in 1983, indicates whether a specific saint was the object of an article published in Analecta Bollandiana or of a book reviewed in the periodical. Its aim and contents differ completely from those of the Indices since it includes only the articles and books dedicated to a specific saint; the secondary references to saints in articles, reviews and bibliography are not listed. Analecta Bollandiana. Inventaire thématique des tomes 1 à 125 (1882-2007). index of saints: every mention, divided into sections depending on whether they are found in an article, a catalogue of manuscripts, a review, or a bibliographic reference. ordering by mail (e-mail, fax or letter), which is advisable in case of subscription to the journal or multiple order. Discounts are granted for bulk-purchase (10 % on the purchase of at least 6 volumes, 25 % on the purchase of the entire collection). Previous issues may be ordered from the publisher: info@bollandistes.be .